I have a Nikon D750 with a Nikkor 28-300mm VR lens. I am an absolute newbie and I've been trying to capture a reasonably good picture of the moon. But no matter what I try, the pictures are never sharp. I've tried mounting the camera (by the camera, not the lens) on a tripod, set the shutter release to remote or timer (2s) and tried taking several shots at varying shutter speeds (10s to 30s) and ISOs (1600 to 6400) with the maximum aperture (f/5.6 I believe) at 300mm. But no matter how I take the photo, the moon always looks a bit blurred. I tried with VR turned on and off, on my lens. What am I doing wrong? Your exposure settings will grossly overexpose the moon. Remember, the illuminated parts of the moon are in direct sunlight! 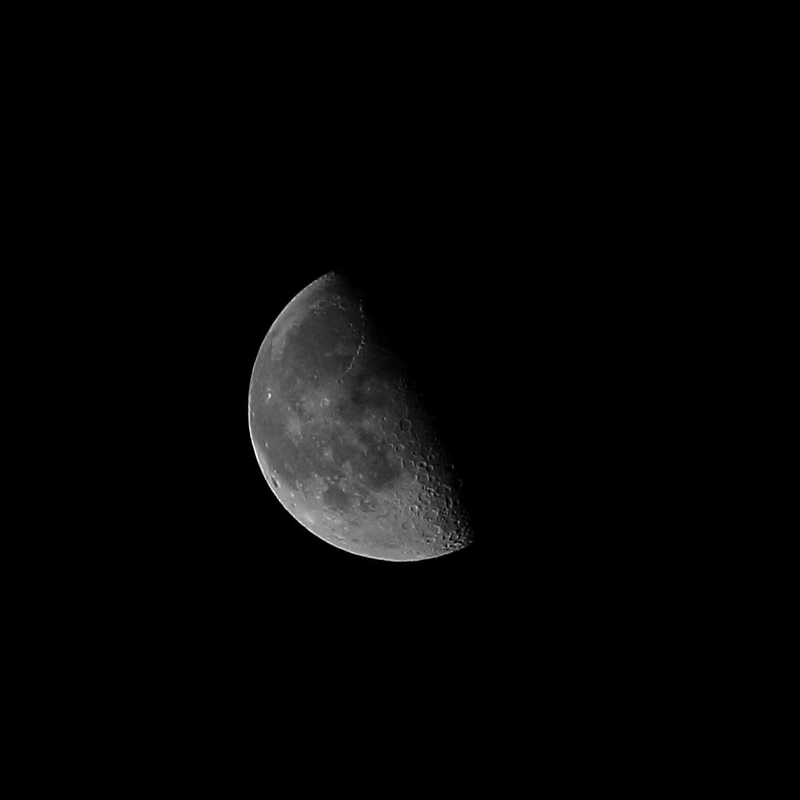 Allowing for the moon's albedo, start with about ISO 200, f/8, and 1/125 second or equivalent. Similar to the 'Sunny 16' rule of thumb, the 'Lunar 11' rule of thumb says to use a shutter time of 1/ISO with f/11. In reality, about one-third stop darker than that is about right. ISO 200, f/8, 1/125. Tripod, cable release, mirror lockup. The dot on the right is the planet Jupiter. Captured 31 January, 2013 when Jupiter passed within less than 1° of the moon. Additionally, the moon moves relative to the same spot on the earth's surface at a rate that works out to be the full diameter of the moon every couple of minutes! Anything exposed longer than about one second will show the moon's motion when a 300mm lens is used with an APS-C camera if the display size is about 8x10 inches and before an additional cropping is done. Since cropping and displaying an image at the same size enlarges the image, it also enlarges any blur present. If you are pixel peeping on a large monitor, your shutter times must be much shorter to not see any blur due to the motion of the moon relative to the earth. ISO 100, f/8, 1/200. Exposure pushed 1.5 stops in post. Canon EOS 7D + Kenko C-AF 2X Teleplus Pro 300 + EF 70-200mm f/2.8 L II IS. Even with the atmospheric conditions in high summer for the Northern Hemisphere, good glass, careful manual focusing, and proper stabilization (sturdy tripod, mirror lockup, remote cable release) can catch good images of the moon. Captured 10 July, 2012. Beyond that, all lenses and cameras have their resolution limits. A "superzoom" lens such as your 28-300mm gives up the best possible image quality in exchange for being versatile by offering a wide range of focal lengths. Such lenses are known to be fairly soft at the longest telephoto end of their focal length range. It could be that the atmosphere or the "seeing" in your part of the world is creating the loss in sharpness. Or it could just be your lens. Super-zoom lenses like your 28-300 are notorious for not being good optically. Or, maybe your lens is just fine. Maybe you're shooting in RAW and you're not adding sharpening to the image? You mention your exposure ranges from 10s-30s at f/5.6 at ISO 1600-6,400. I think this is probably your problem. Moon exposures are counterintuitive in that because it's night time, people think that they need long exposures at high ISO settings. This is simply not true. While scenes lit by the Moon are dim and require long exposures, the Moon itself is the 2nd brightest object in the sky, next to the Sun. In effect you are photographing sunlight which means that your ISO should be at 100, your exposure should be about 1/125 at f/5.6. Based upon the details of your question, you are severely overexposing the scene. After thinking about your situation, I realized that the reason your images are blurry is because of the Earth's rotation. 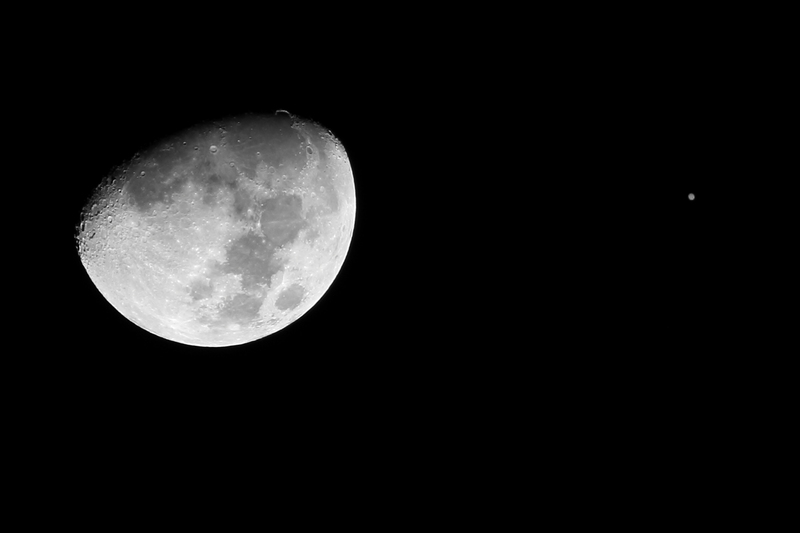 The Moon moves rather quickly as you probably noticed while looking through a telescope. Well, at 10-30 second exposures, the Moon is going to move quite a lot! 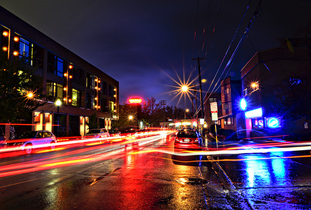 So what you're seeing is motion blur caused by using too long of an exposure. Your exposures could be about correct for the Milky Way stars (ISO 6400, f/2.8, 30 seconds, except the Earth will rotate in 30 seconds and will make star trails on a fixed mount). But the moon is illuminated by our same sunlight, and is about the same exposure as daylight here on earth. Assuming full moon, maybe ISO 100, f/8, 1/320 second. Reasonably normal daylight exposure. No blurring issues. Our astronauts on the moon could use normal daylight exposures. But the lesser phases of moon will need more. 2 seconds f/8 could be correct a couple of days from the new moon, and maybe ISO 100 f/8 1/60 second for a quarter moon. The moon reflects 12%, so it is slightly darker than an 18% card.. It should NOT be white. Not the answer you're looking for? Browse other questions tagged dslr moon nikon-d750 or ask your own question.